Inspired by this philosophy the idea for Ferdinand’s Classics was born. As long-time Porsche enthusiasts, the initiators Edwin Spaltman and Martin Vaanholt believe in the appeal and value of classic Porsches. A strong believe in the passion of owning a unique classic Porsche for sheer pleasure as well as a object of future investment. This is how the idea for Ferdinand’s Classics has originated in a dream come true. The journey to search and find the right classic Porsche is often a long and intensive one. Next to this, strict selection criteria and expertise are needed to separate the wheat from chaff. Next to offering a unique collection of high quality Porsches we are pleased to help you in your journey to find your ideal classic Porsche. Additionally, we can help you with advise during the purchasing process and we also provide support for restauration projects. Furthermore you can contact us for selling your current classic Porsche. Ferdinand’s Classics is about sharing the passion for the Porsche brand with other Porsche enthusiasts in order to give classic Porsches a lasting future. 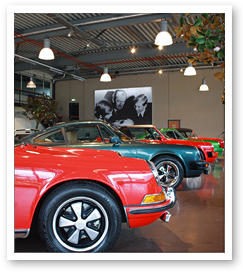 This ambition is realized from the number one Classic Porsche Center in the Netherlands. A life long passion for Porsche has resulted in an attractive classic Porsche center in a pleasant and carefree setting. Warm and classic looks with a modern twist, but most importantly the experience with a strong reference to the philosophy of Ferdinand Porsche; a revival of the Porsche brand glory.